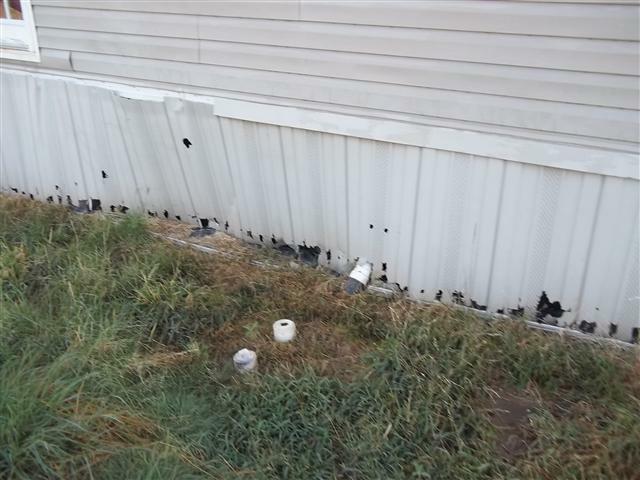 (1) This mobile home inspection photo is of skirting with substantial weed-eater damage as well as missing the required bracing…. notice the runners at the bottom laying on the ground versus on treated lumber. 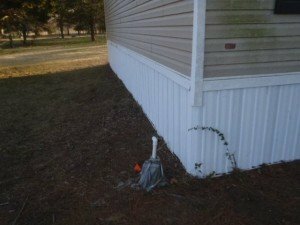 (2) This photo is of undamaged skirting. 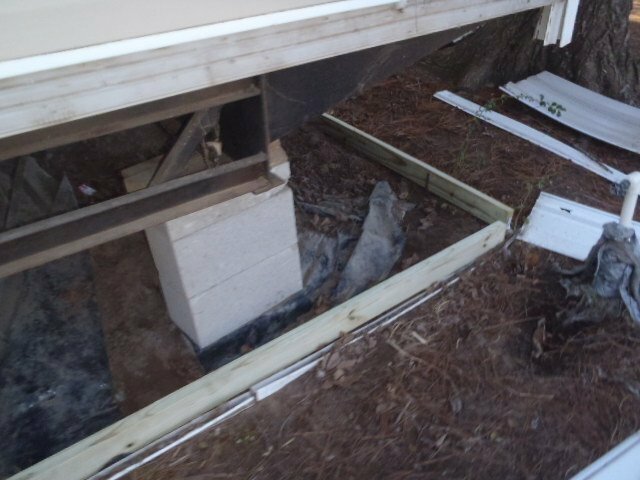 (3) This inspection photo from inside the crawlspace shows the corner bracing using treated 2 X 4’s for the bottom of the vinyl skirting. As long as the 2 X 4 is secured, at each end, to the ground by rebar or other material to prevent lateral movement, it will meet code. (4) The above inspection photo is a close-up of bracing being installed prior to the panels being placed. Note the rebar already set in place. This type bracing will hold skirting that is up to 36 inches in height…. Skirting higher than that may need an additional horizontal brace midway between the bottom brace and the top trim. 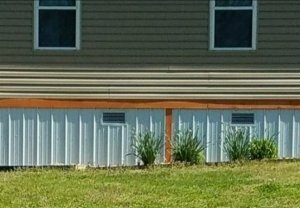 (5) For skirting higher than 30 inches, there also needs to be vertical bracing placed every 8 to 10 feet. (6) This recent inspection photo shows a close-up of the treated 2 X 4 needed to supply wind bracing for vinyl skirting. (10) This photo is an example of properly vented skirting.